Compiled by: Arsène Roux †. Translated by: John Cooper. Collected by: John Cooper. Edited by: John Cooper. Series edited by: Harry Stroomer. 12 pp. Roman, 223 pp. The French berberologist Arsène Roux (1893–1971) dedicated a great part of his life to the study of the Berber languages of Morocco. 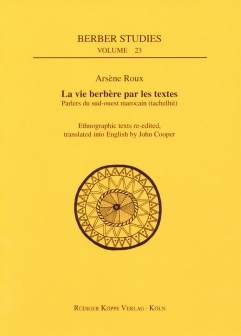 The ethnographic text collection La vie berbère together with four other compilations makes up a series of compendia assembled and annotated by Roux and intended as study material for scholars of the Moroccan Berber languages. In 1955, this compilation was published as volume I of the series Collection de textes berbères marocains by Éditions Larose in Paris. The newly edited first part of this publication contains original texts of the Berber language varieties of the Souss plain and the Anti-Atlas as well as of the region around Marrakech. They treat of the material sphere of the life of the Berber people of Southwest Morocco. Everyday life of this ethnic group is reflected in discussions and monologues treating of topics such as traditional homesteads, clothing, agriculture and animal husbandry. Artisanry and trade with surrounding peoples are as important in this ethnographic study as views on the weather, occurrences of sickness and death and life philosophies in general. This publication presents a first time translation into English. The linguistic footnotes by Roux are amended by further comments of the editors and translators. Not only of interest to linguists and berberologists, even more than 50 years after ist first publication this ethnographic description of traditional Berber culture in Morocco still is a major enrichment for cultural sciences in general and the Oriental studies especially.